As I blogged about in yesterdays Grilled Portabella Mushrooms post, my husband and I just returned from a vacation in Napa where we had an amazing time. After dropping the boys off at my parents house, then catching up on sleep for the first 3 days of our trip, we stepped out to some of the valley’s fabulous restaurants. First we went to a restaurant in St. Helena called Press. It was easy to get into and they handled the gluten free thing really well. My husband had steak and I had salmon which was delectable. We also ordered sides of broccoli and mushrooms which were fantastic. That was Press, I highly recommend it. Next we went to Dry Creek Kitchen, Charlie Palmer’s restaurant. I was feeling a little sentimental about this venue as Palmer’s New York City restaurant Aureole, was one of my first clients back in the day, when I had my environmental consulting company Ecosav, or rather back when I was 25. I met directly with Charlie in those days, before he was a superstar and he used to tell me about his farm in upstate New York –he was doing farm to table before there was actually a name for it. Being in his kitchen was great fun and he always had a tight knit crew in there. So going to Dry Creek Kitchen in Healdsberg was a thrill in many ways. I started with a salad and then had the fish (sorry, can’t recall which kind) and both were outstanding. The gluten free aspect of the meal was very well handled, though a word of caution, the maitre de told us that a wheat thickener is used in all of the ice creams. 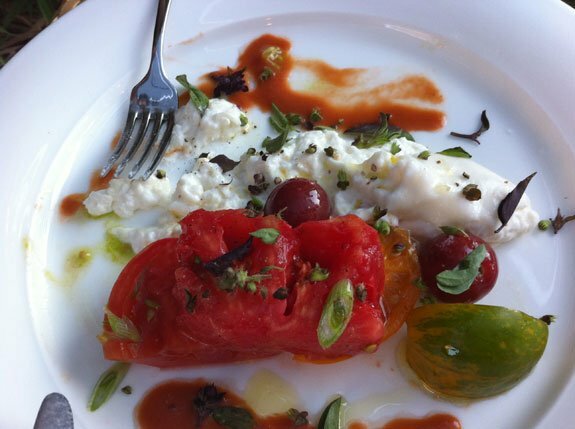 After Palmer’s Dry Creek Kitchen in Healdsburg, we went to Bardessano in Yountville. The food there was fantastic and we must have been fairly well rested by that point as it is when we were awake enough to start thinking about taking pictures of our food. I confess, photographing my meal in a restaurant is not something I’ve ever done before, though it was fun. I had the tomato salad to start, then the outrageously good scallops and for dessert a meringue type dessert with strawberry sorbet. Amazing. All of it! 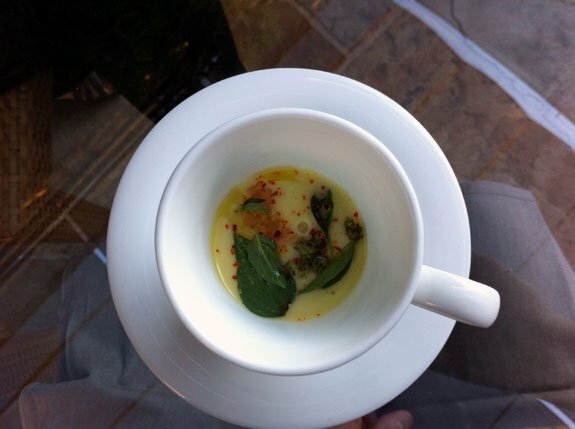 Oh, and at Bardessano they also served this incredible little amuse-bouche of raw melon basil soup. Delicious! That day, we also took a tour of Silver Oak Cellars which was gorgeous and state of the art. If you’re in Napa, I highly recommend a visit there. On our last night of vacation, we went to Redd in Yountville, which was also amazing. I had a fabulous salad to start with local goat cheese, then scallops with cauliflower which were absolutely amazing. My husband had the pork chops, which he said were the best he’d ever had. 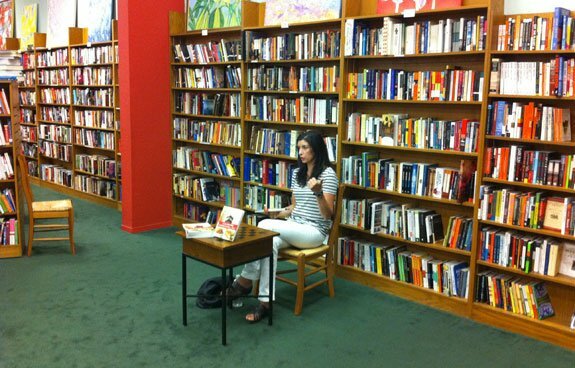 Next it was off to Davis to see the boys and do two book signings. The first one was at the Avid Reader and the second one was through the Celiac Sprue Association. Both went very well and it was so great to meet new faces. Finally, my sweetie and I went to my 25th high school reunion, the next day, the 4 of us traveled home. It was a wonderful vacation full of sleep, fun and friends and couldn’t have been better!